Would you believe me if I told you that the photo you see above was taken here in the Philippines? Well, believe it. It is. And that’s one of the reasons why this photo is probably my favorite among the other shots I have ever taken during my travels. But read on, I still have more to say. This is a photo of the wooden fence you will see upon entering Racuh A Payaman in Batan Island, Batanesâ€”our very own Marlboro Hills. I took it in a rush, as my husband had already started nagging me to get on the multicab, threatening me that if I ever got left behind, I would never see my Shih Tzu ever again and all I would be stuck with were cows pooping just about everywhere. But I couldn’t help itâ€”I had to take as much photos as I could, just so I’d have something to look back to when I got back to Manila. 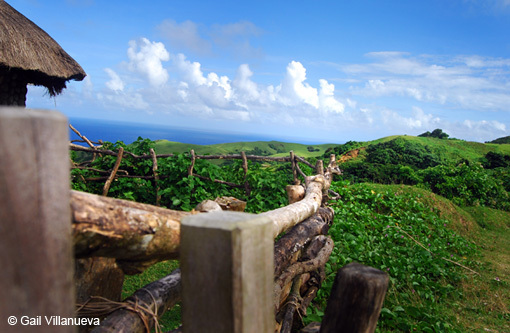 My experience in Batanes changed a lot of the way I saw things. I learned that it’s still possible to experience an untainted Filipino culture taking great pride in honesty, hospitality, and bayanihan. I learned that there are still people in a community so closely knitted that they’d even take care of their neighbor’s dog if he wandered into their homes. I learned that a place of such breath-taking beauty still exists in the Philippines. There are a lot of things I learned and saw in Batanes that I don’t think I’d ever see here in Manila. These have given me a better reason on having a travel blog: from a superficial thinking of simply separating a travel-related posts in a niche blog, I am somehow feeling a sense of duty after experiencing one of the Philippines’ most beautiful provincesâ€”a duty to let as much people know about our country’s unexploited natural resources. This photoâ€”my favorite travel photoâ€”is a constant reminder of how Batanes opened my eyes to places and people I have never thought possible to exist in this country of ours. This post is my official entry for the “What’s your best travel photo?” Contest of my good friend and travel buddy Nina of JustWandering.Org. How about you? Have you submitted yours yet? This entry was posted on Wednesday, 17 December 2008 at 10:57 pm and is filed under Contests, Travel. Kutitots now on WordPress 2.7!!! Wow! I love this photo. Maganda pala sa Batanes. I thought it’s all rocky. This is a nice photo. Do you have post about technique in taking a pictures. yeah, the picture does look nice. Been to Batanes myself and i quite agree with you that the Ivatans are very good examples of a good, real Filipinos. i’m planning a trip to Batanes soon. just like to ask what month did you travel there? i’m making sure that it’s not the rainy months that i get to book there. great shot! not your typical touristy shots. very creative.